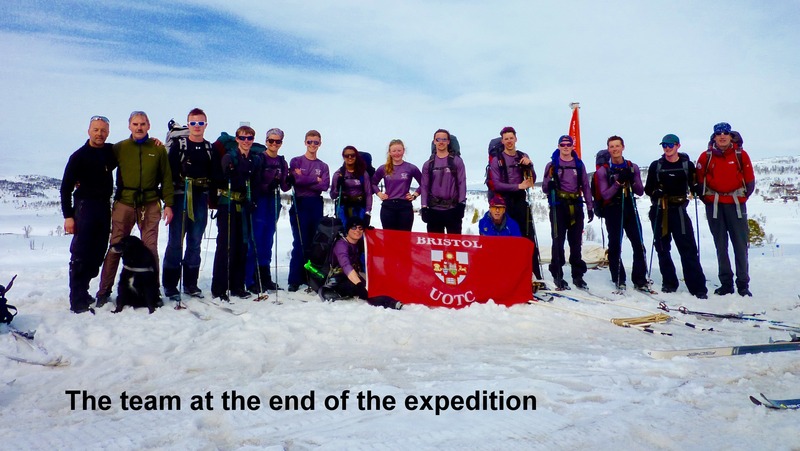 The 29th March 2016 saw twelve Officer Cadets (OCdts) and two members of staff from Bristol University Officer Training Corps (BrUOTC) embark on Exercise CABOT TELEMARK, a twelve day Nordic Skiing Expedition to Norway. The aim of which was for the group to become competent Nordic Skiers and gain either a Nordic Foundation 1 or 2 Joint Service qualification. At the same time OCdts were to be ‘immersed’ into the arduous environment and situations experienced by the British and Norwegian soldiers of the WWII Operations GROUSE, GUNNERSIDE etc. through participating in the ‘Real Heroes of Telemark’ battlefield tour across the Hardanger Vidda. 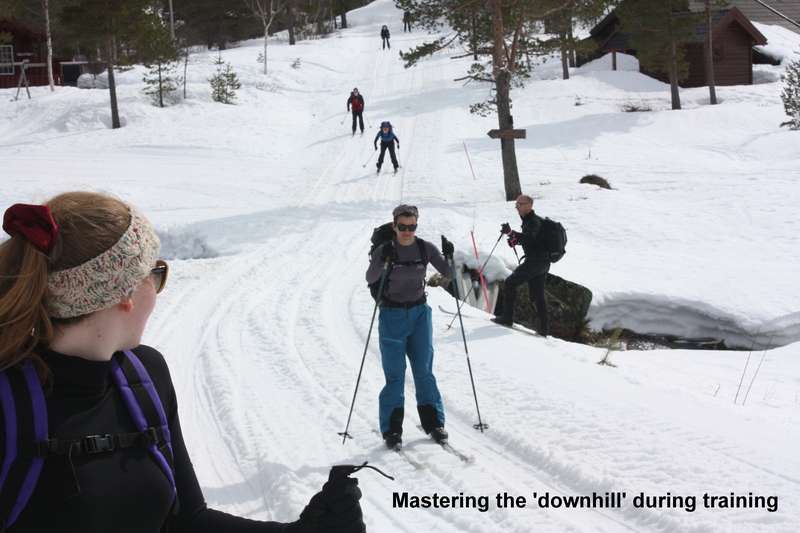 Also on the programme was potential Nordic Ski Leader development for those with the relevant experience, whilst all participants would benefit from the chance to enhance team working and leadership skills in a difficult environment. After a 15 hour journey we arrived in the early hours at our base for the training phase, Troll Aktiv in Evje, where we happily bedded down for the night. Throughout the initial period, days were spent visiting local ski training areas, Hogas and Bortelid. We progressed through the basic skills of Nordic skiing through to short tours carrying rucksacks replicating the weight we would be expected to carry on our tour across the Vidda. 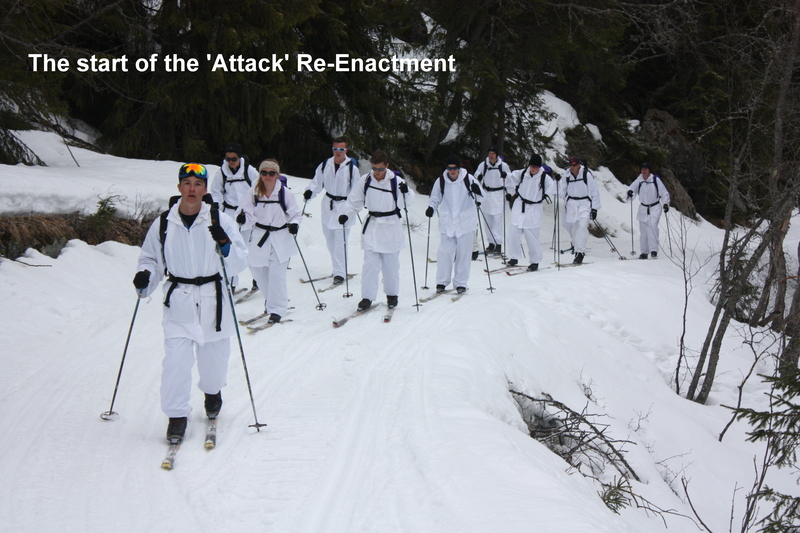 Thrills and spills ensued with most OCdts spending more time on the ground than on their skis! Other skills taught included an introduction to the mysterious art of ski waxing, use of skins to ski up-hill or the ‘hard-core’ version of getting up a slope; skating. At this stage skating on Nordic skis was a skill that was elusive to most but very funny to watch. As most of the Exercise was self-catered, a very important part was making best use of our limited funds for food. The group was split up into teams of three to plan, purchase and cook each day with the evening meals developing into a ‘Come Dine with Me’ competition, some being more successful than others! Evenings also included a variety of lectures ranging from avalanche safety to rucksack packing, navigation and route planning. Our knowledge of the actual WWII Operations and the terrain we would encounter on the Hardanger Vidda was increased through detailed and insightful talks together with watching Ray Mears’ documentary, ‘The Real Heroes of Telemark’. The four day Nordic ski tour started with a three hour coach journey North via Hoveden to where we were to meet the snow-scooters that would insert us into Hardanger Vidda. Due to a change in conditions and unexpected hut maintenance we had to go further to our first hut, Smerheller. The rest of the day consisted of learning how to efficiently pull a pulk, hut routine and etiquette together with continuous snow melting. Day two started with a short 4km snow-scooter ride across Lake Songavatnet, where we then started touring. The group was split into ‘pulk teams’ – a group of four on each of the three pulks. Pulk pulling was rotated every 20 minutes, whereby everyone took turns to pull the 30kg sledge. The first day was particularly demanding on everyone with a long climb off the lake and up the Valasjadalen valley. After 24km we reached our accommodation, two small mountain huts, Rolegholet and Rjupehytta by the side of Bitdalsvatn Lake, which again served as a welcome sight for everyone. One pulk team went in the first and two in the second hut. As we parted our thoughts were on whether it was going to be Karaoke or cards after our well-deserved rehydrated ‘Turmat’ meals. 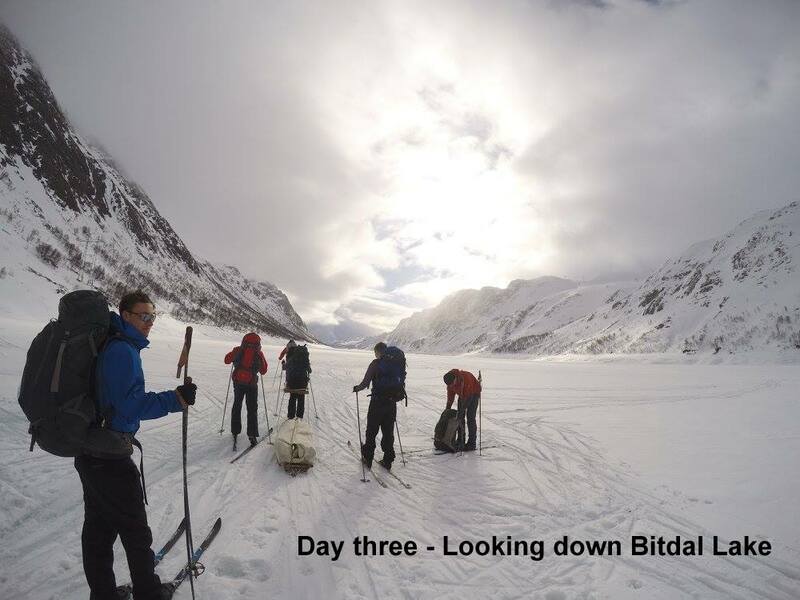 Day three and our continued crossing of Lake Bitdalsvatn was interspersed with some GPS and navigation training; heads down, intently looking at a compass or GPS whilst wandering around pretending to be in a ‘white-out’ must have looked very odd to any passers-by! After leaving the lake we covered some undulating and technical ground, where good teamwork was vital. 18km covered and we arrived at Reinnarhytta our final hut of the expedition, not that we used it much! 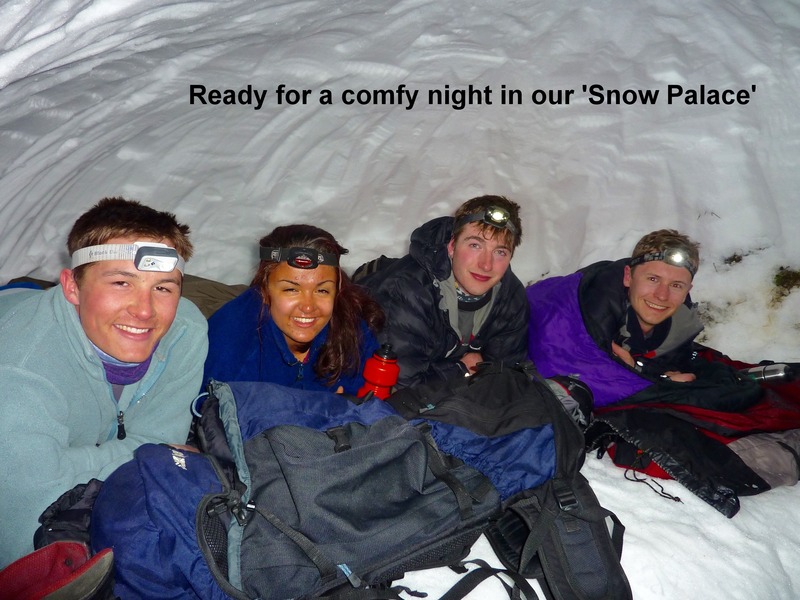 This was going to be our chance to sleep in our own DIY ‘snow-holes’, a challenge that everyone was soon involved with. After hours of digging, sawing and shovelling later the shelters were constructed, and everyone bedded down to a candle lit night in their newly constructed ‘snow-palaces’. Next morning, awakened from a warmer than expected night, and after a hot breakfast in the hut we soon departed for our last day touring across the Vidda. Although the shortest distance, our route encompassed the steepest hills so far. A short detour, from our route to the pick-up point took us up to the Leif Tronstad memorial. This memorial – along with the original saboteurs huts that we were lucky enough to have used en route – aptly brought to life the historic relevance of the expedition. A final gentle incline later, we arrived at the finish of our tour at Vierli ski centre and an eagerly anticipated burger and chips. The final part of our ten days on snow began with us retracing the infiltration ‘attack’ route that the saboteurs took on their approach to the Norsk Hydro Electric Plant at Vemork. Dressed in camouflage ‘whites’, this was the culmination of the trip as it put into perspective the feat undertaken by the saboteurs to stop Hitler creating the first atomic bomb. Following a tour of the factory and an insightful documentary that pulled everything together we finished off with the ‘Escape Challenge’ up the original extraction route. BrUOTC rose to the test and put in a strong performance with everyone finishing in less than an hour; one of the team smashed the women’s record and another just missed out on the men’s. In the comfort of a Mountain Lodge the final evening was finished off with group presentations bringing specific aspects of the various Operations into a modern context plus highlighting what could be learnt. Last minute packing followed the certificate presentation ceremony for ‘The Hardest Battlefield Tour in the World’ and an early night before returning back to the UK the following day. Exercise CABOT TELEMARK was a rewarding and humbling experience for all involved and all members are hugely thankful to the Ulysses Trust for their generous support. It was a great challenge and fantastic opportunity to gain new skills and qualifications whilst reliving a feat of history that should not be forgotten.